Sharp is proud to showcase at PRINT 18 the Pro Series MX-8090N Color Document System, which will be configured with the high-powered MX-PE13 EFI® Fiery® Print Server featuring the latest FS300 Pro platform. This highly reliable workhorse will be outfitted with the Plockmatic Production Booklet finisher, showcasing Sharp's award winning edge-to-edge printing feature which allows full-bleed booklets up to 120 pages be printed and finished in-line with professional results. The 80 page per minute (ppm) MX-8090N and its 70 ppm counterpart, the MX-7090N, round out Sharp's production product lineup. These models offer exclusive, full integration of Fiery® Command Workstation® at the operation panel. This further enhances the ease of use and precision control Sharp brings to the production market when configured with the MX-PE13 Fiery Print Server. The groundbreaking edge-to-edge printing capability makes these models a "must see" at the event. 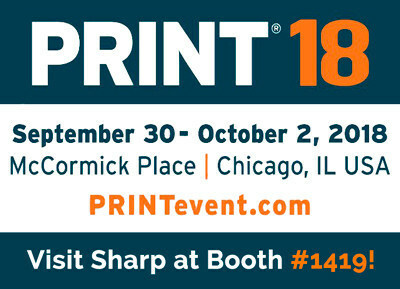 "The Sharp team is excited to once again return to Chicago for PRINT 18, where we have an excellent opportunity to demo our latest products to existing and potential customers," said Kent Villarreal, Senior Product Manager, Product Planning and Marketing, Sharp Imaging and Information Company of America. "Our Pro Series additions represent the newest in technology from Sharp in the Print-On-Demand space and we're sure they will spark great interest at the show with their ease-of-use, high quality and precision control." For those customers not requiring a Fiery print server, the MX-7090N and MX-8090N standard print controllers now include Pantone Licensing as part of Sharp's continued focus on color matching. These models add to the long list of MFPs offered from Sharp that are Pantone licensed. Through PANTONE® Color Matching, Sharp MFPs are easily able to reproduce colors from the PANTONE Coated Series of colors without the expense or required expertise that sometimes comes with optional software or hardware. There are now a total of 16 current Sharp color models with this capability, including the new models. Come visit Sharp and speak to a Fiery Certified Expert. All Sharp print production managers have achieved the highest level of training attainable through EFI. This provides direct access to EFI support engineers and helps to guarantee the best possible support to Sharp's customers. This world-class support is essential for production and Fiery-connected environments, where productivity is a must. Sharp's print production managers will be on-site at PRINT 18 to answer questions and provide demos on the newest products. Sharp is exhibiting at PRINT 18 in booth #1419, from September 30 – October 2, in Chicago. About Sharp Imaging and Information Company of America: Sharp Imaging and information Company of America, a division of Sharp Electronics Corporation, markets Sharp's business products, including the advanced MX Series multifunction printer (MFP), that help companies manage workflow efficiently and increase productivity. Sharp MFPs feature the Sharp OSA® development platform, which seamlessly integrates network applications to create a personalized MFP that can meet virtually any business need, and Scan2 technology, which scans two-sided documents in a single pass to enhance scanning reliability and preserve document integrity.